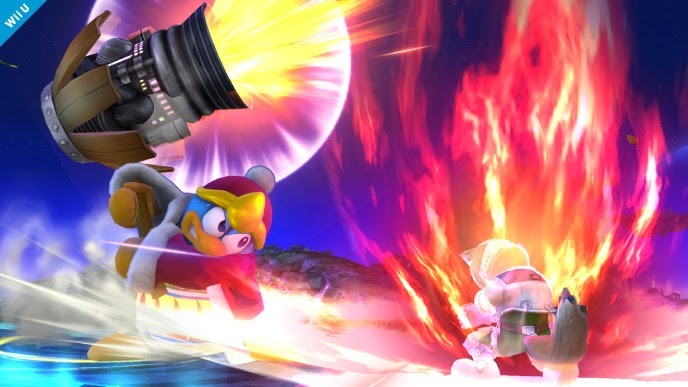 This screenshot confirms the return of assist trophies for Super Smash Bros. 3DS and Wii U. This assist trophy shows Saria from The Legend of Zelda: Ocarina of Time 3D. This screenshot shows part of Rainbow Road stage for 3DS. Fox and Wii Fit Trainer are bouncing on the mushroom platform, doging Shy Guys, a returning obstacle from the Mario Kart stage from Brawl. 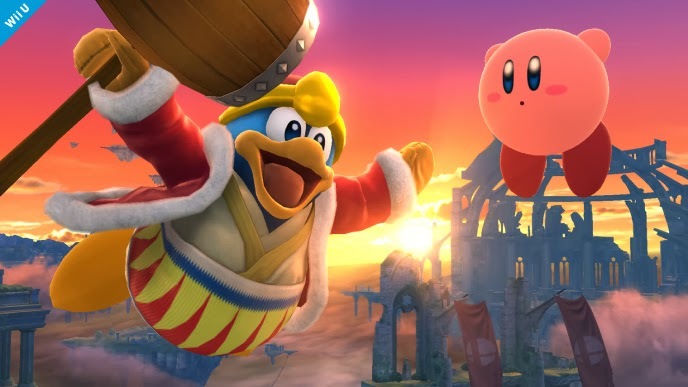 Here we see King Dedede with Kirby on the Wii U Pilotwings stage. 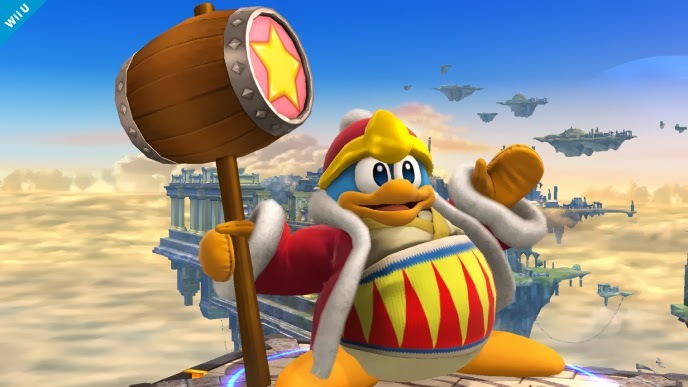 Sakurai announced that King Dedede is a playable character, celebrating the release of Kirby: Triple Deluxe in Japan. 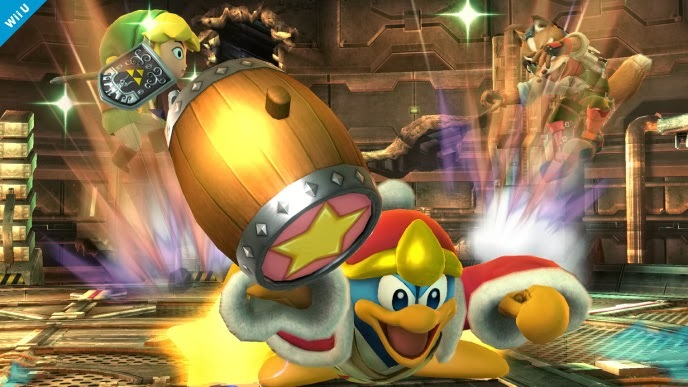 This screenshot shows King Dedede's strong side attack being used on Toon Link and Marth in a Metroid-themed stage. 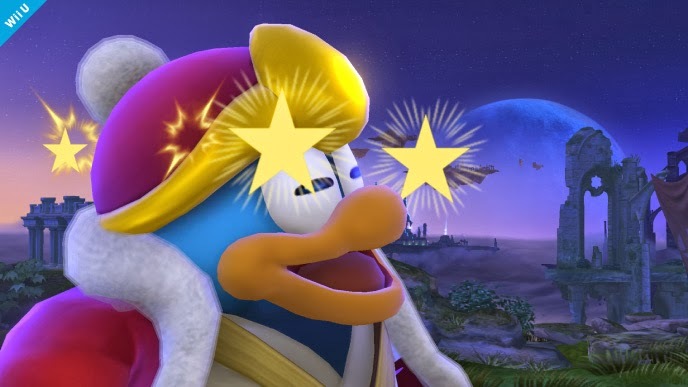 Sakurai explains it's one of the most powerful attacks in the game. 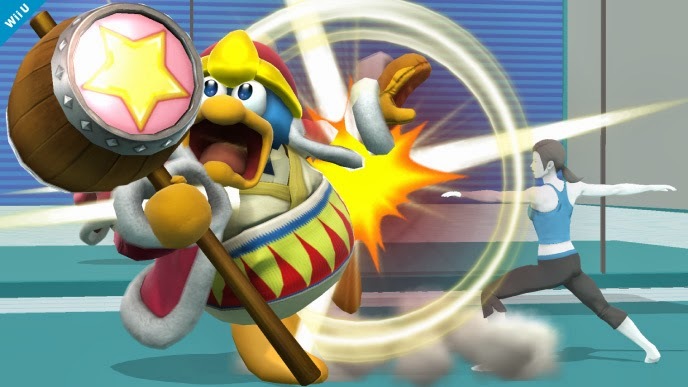 This screenshot shows Rosalina using her strong up attack and Luma using an uppercut attack on the 3DS stage Battlefield. 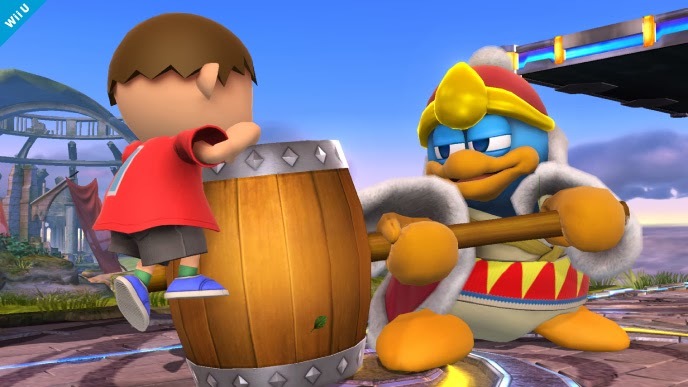 This screenshot shows Ashley from the WarioWare series playing a role as assist trophy. 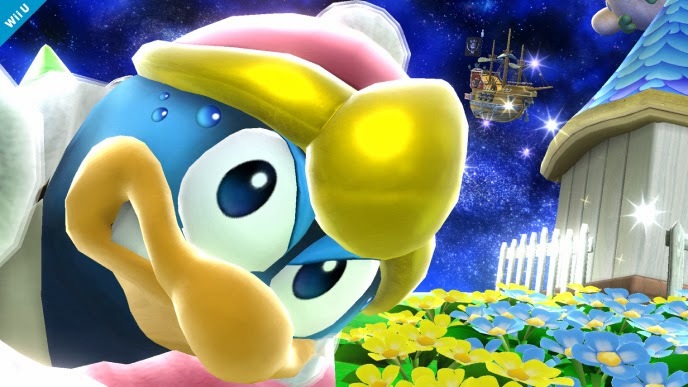 She is showcased on the Super Smash Bros. area stage on Wii U. This may be confirming Wario as a playable character and possibly a WarioWare stage, similar to the stage in Brawl. 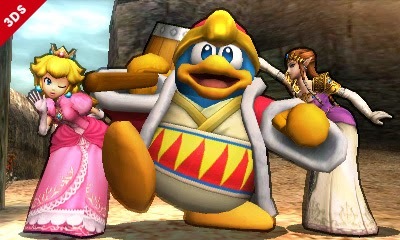 This screenshot shows King Dedede, Bowser, Donkey Kong and Mario in the Pilotwings stage, once again. 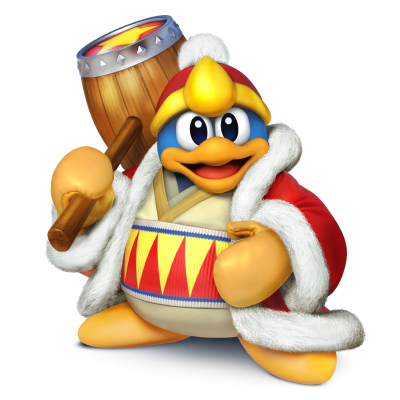 We can see how much bigger DK, King Dedede and Bowser are to Mario in a better perspective. 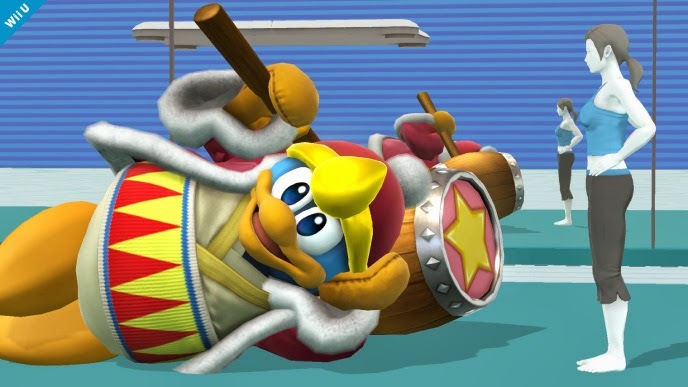 These two screenshots show a knocked-out King Dedede and Zelda on what looks like a Pikmin stage. Both images released on the same day, you can see the ammount of detail that has been put into both characters. So, will Wario be added as a playable character as in Brawl? What characters do you want to see next?